HOUSTON (KTRK) -- Authorities want to find the gunman who killed a 41-year-old man in front of his wife in northwest Harris County last night. 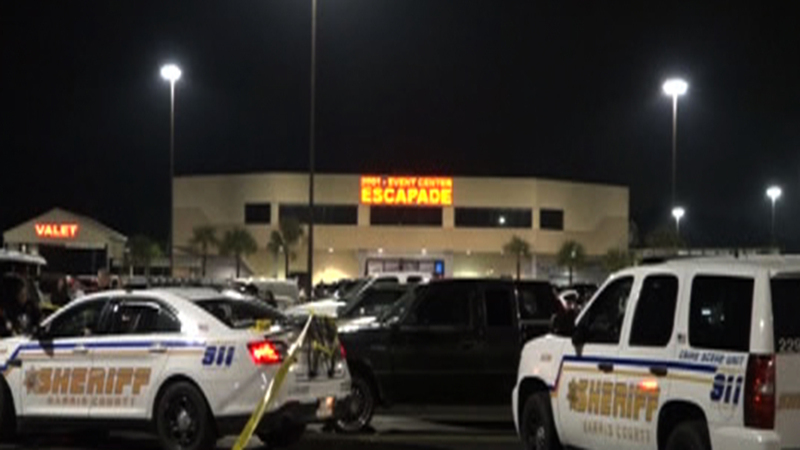 Harris County Sheriff's Office deputies say Ruben Acosta and his wife were sitting inside their car around 10pm near Club Escapade on the Eastex Freeway near Aldine Mail Route when a vehicle pulled up behind them and a man walked up to their vehicle. Deputies say the man tried to rob the couple. Though it's not yet clear if the husband died while trying to protect his wife, authorities say the gunman shot Acosta several times and escaped empty-handed. The wife was not hurt. Acosta died at the scene. Deputies are reviewing surveillance video from the club's parking lot with hopes of identifying the suspect. According to the Harris County Sheriff's Office, the suspect drove a silver or tan vehicle. Anyone with information in this case is asked to contact the Harris County Sheriff's Office Homicide Unit at 713-967-5810, or call Crime Stoppers at 713-222-TIPS(8477).